A camp was conducted at Chakan Gramin Rugnalaya on 27th march 2019. A total of 50 OPDs were done with36 patients were rendered treatment. Treatment provided was topical fluoride application with APF gel, pit and fissure sealant, Restoration, tobacco cessation counseling and scaling. Dr.Abhishek Kumbhalwar (post-graduate student) was accompanied by 2 Interns and 2 final year students. World Water Day and Free Dental Check Camp Department of PHD in association with Rotary Club of Pradhikaran organized a free dental check up and health education camp at a Government school Bal Bhavna , Kharalwadi. A team of 6 interns under the guidance of Dr. Amol Mathur, Associate Professor, Dept of Public Health Dentistry did oral health check up of 356 students and educated them towards importance of brushing and maintenance of oral hygiene.World Water Day was celebrated by informing the children regarding the importance of water and educating them towards reducing water misuse and saving water. The celebration of World Oral health day started rather early this year in the Department. Oral check –up and treatment was delivered to the Transgender Community where in 49 were screened for oral health and 27 were treated by providing tobacco cessation counseling and scaling. They said , Ahh and acted on Mouth Health and they will be followed up on a monthly basis through telephone counseling for giving up the habit of smokeless tobacco.Behavioural counseling sometimes sends strong messages across and helps them give up the habit as we observed in Yerawada slum where, one of them offered Rs.12 to goddess Kali which was meant for purchase of Smokeless tobacco. Thus began the journey of Manuja towards a tobacco free living.Ayush, Dhanashree, Yash were the interns involved with the outreach activity along with Dr.Abhishek and Dr.Sahana. A camp was conducted at ZillaParishad school of Bhimashankar on A total of 110 OPDs were done with 40 treatments. Treatment provided was topical fluoride application with APF gel, pit and fissure sealant and scaling. The camp was conducted on the occasion of Dentists day and school children were educated regarding tooth brushing technique and oral hygiene practices. Dr.Sonal Kale was accompanied with 5 Interns of Department of Public Health Dentistry for the camp. 20 Patients benefitted from dental check –up and 17 patients had their scaling done after a thorough oral check-up. Few patients were councelled to give up the habit of tobacco chewing. Dr.Sahana,Dr.Abhishek and 2 interns lead the team. 837 school children were checked. Oral health education imparted and the class teacher was informed abourt the oral health problem faced by most children.The children were educated to see a dentist at the earliest so that they could be treated.Alumnus of Dr.D Y Patil Dental College,Dr.Ronak Oswal actively participated in the check-up program along with Dr.Sahana,Dr.Kunal and the interns of the Dept. A camp at Government Hospital, Chakan was organized with reference to the Road Safety Week by Department Of Public Health Dentistry. Free dental consultation along with various dental treatments was provided to the 34 people visiting government hospital. Along with it the people were informed regarding the benefit of wearing helmet and following traffic rules. Health education towards Tobacco Cessation was provided to the required candidates. Inters along with Dr Anmol Mathur Associate Professor Department Of Public Health Dentistry conducted the camp. A camp at Bamboli, Khed was organized with Tata Motors by Department of Public Health Dentistry on 6/02/19 from 9:30 AM to 4 PM. They were informed/educated towards the ill effects of tobacco as well as benefits of good oral hygiene. Awareness was created about cancer. Brushing technique and diet counseling was provided to children The team constituted of interns under the guidance of Dr Abhishek. A total 222 OPD and treatment of 44 patients were done. On the Occasion of world cancer day a camp was organized at chakan gramin rugnalaya , Pune by Department of Public Health Dentistry on 4/02/2019 from 9.30 AM to 1;00 PM, during which people received free oral health examination as well as treatment. They were informed/educated towards the ill effects of tobacco as well as benefits of good oral hygiene. Awareness was created about cancer. The team constituted of interns under the guidance of Dr sonal and PG Dr. Kunal Deshmukh. 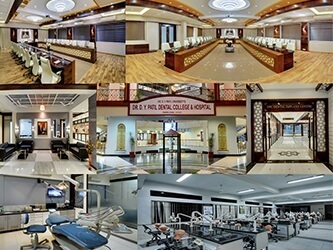 Sant Tukaram Nagar,Pimpri, Pune 411018, Maharashtra, India.